Hvar Island is often known as the pearl of the Adriatic and the sunniest, with an annual average of 2724 hours of tireless sunshine year-round, making Hvar Villas the perfect place for your holiday regardless of the time of year. As well as being the sunniest island in the Adriatic, Hvar is also known for the friendly locals and beautifully rich plant life that covers most of the island. Most famously, the internal parts of the island contain numerous lavender fields. 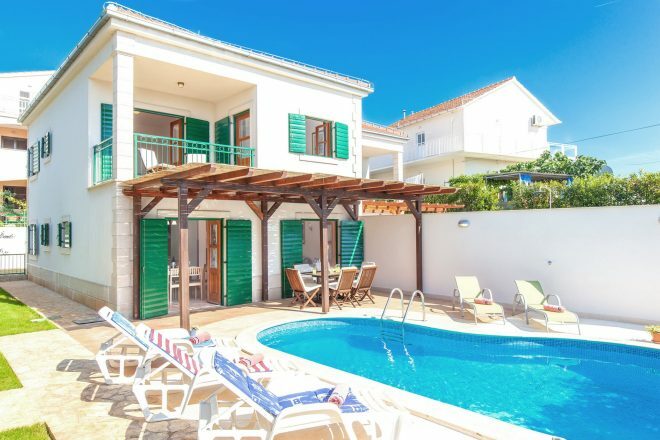 We have a range of Hvar Villas located throughout the Island for you to enjoy during your stay. The old town is a short distance away from a strange phenomenon called the Blue Cave, where the water appears to glow as if by magic. 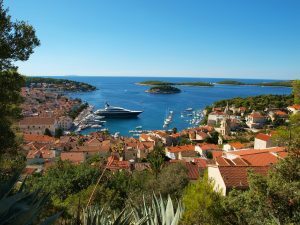 Hvar, like most of Croatia, has a rich history that still has an impact on its culture and tourism today. There are beautifully preserved cathedrals and fortresses which spin tales of its religious, but a sometimes brutal history of Croatia. An island surrounded by crystal clear waters and lush greenery ensures there are ample natural sites to explore and discover. In the bay towns of Vrvoska, Jelsa and Stari Grad you will find stunning old stone houses, clean beaches and the best Hvar villas. Ferries from these bays allow you to visit the nearby island of Brac for the day. East of the island is home to smaller, traditional villages where you can visit the famous Hvar lavender fields and catch sight of prehistoric culture. Like most of Croatia, Hvar is home to olive groves and vineyards where authentic Croatian olive oil and stunning wines are created. Be sure to sample both on your Hvar holiday! Hvar is an island with plenty to do, both in the day and at night. Hvar Town has a lively square where you will find all sources of entertainment including bars, restaurants and clubs. With such a variety of things to do on Hvar, it is a firm favourite for families, couples and friends alike. We offer a plethora of staying options for the perfect Hvar holiday, from cosy homes to luxury villas in Croatia with private pools. 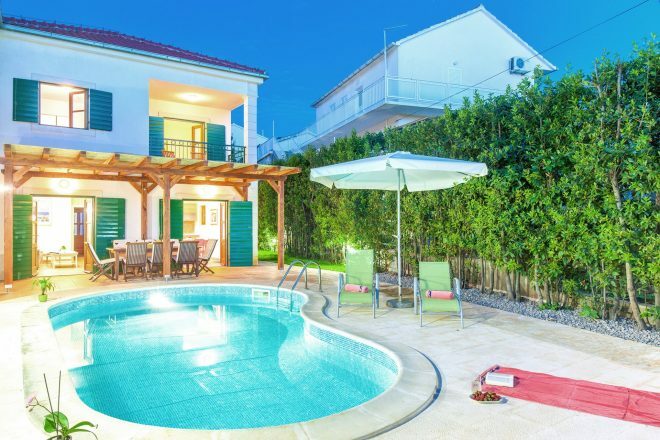 View our beautiful Croatian villas below. now where Stari Grad is, inhabitants of the island have dated back to almost 4th millennium BC. This was evidenced by archaeological discoveries in the Grapčeva cave, who found engraved ceramics representing the Neolithic culture. Croats came to the island in the 7th and 8th centuries, accepting Christianity and starting traditions that are still used in Hvar today. 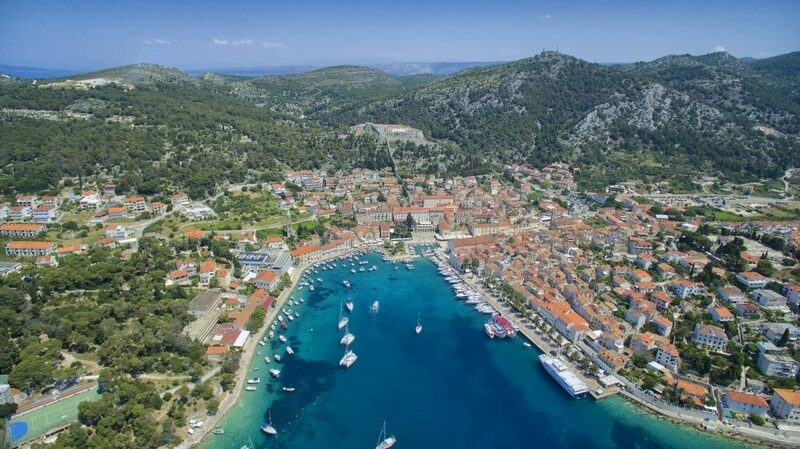 In the 15th century, Hvar was overtaken by the Venetia Empire who chose the island for its impressive port and used it as a major naval base. This period was a famous time for the culture of the island where the arts prevailed with one of the first public theatres in Europe and important literary figures prospered such as Petar Hektorović and Hanibal Lucić. occupied by the French and then became part of Austria, a peaceful time for the island. During this time the island became prosperous with olive trees, the famous Hvar lavender and fishing which paved the way for some delicacies you can still enjoy today. detrimental to the creation of tourism in Hvar today. Hvar cuisine is, of course, Mediterranean cuisine. 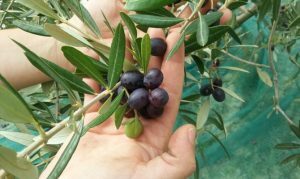 Hvar chefs have managed to retain the authentic flavours and aromas that have been around since the beginning of Hvar. Traditional dishes truly represent the rich heritage of this island and speak for the colourful rule the island has had in past centuries. Being a significant port, Hvar cuisine is rich with seafood and fish dishes. Most famously is the Hvar Gregada which is a rich fish soup with potatoes, garlic, wine and onions. Brujet is another fish dish, a simple but flavoursome seafood stew that is often served with polenta. As well as fish fried, barbequed, grilled and boiled, other seafood is used often in dishes. Octopus, crabs and other shellfish is used in a variety of dishes such as seafood risotto, pasta & gnocchi. Although fish is the delicacy of the island, meat dishes are also popular. Pasticada is a beef stew that goes through meticulous preparation creating a flavoursome dish that you’ll be dying to recreate. Goat, veal and lamb prepared in an assortment of ways marinated in traditional herbs which will satisfy the fussiest of meat eaters. Goat’s cheese is very popular in Croatia and Hvar is no exception. You are sure to find many dishes with this soft cheesy integrated in some way. After a hearty meal, you’ll be craving something sweet whether this is one of the island’s traditional desserts or a bottle of their high-quality wine. If you fill yourself with food and sweets, make sure to try one of the many varieties of wine on the island of Hvar. Hvar has been known for winemaking for centuries and this hasn’t changed in recent years. Private winemakers provide the highest quality grapes which create the perfect wine that you are sure to not be disappointed with. Hvar wine is a must when sat around the pool on your Hvar Villa Holiday. Hvar is a historical hub and has a lot of attractions. With a rich history and culture, you are guaranteed to never be without an activity. 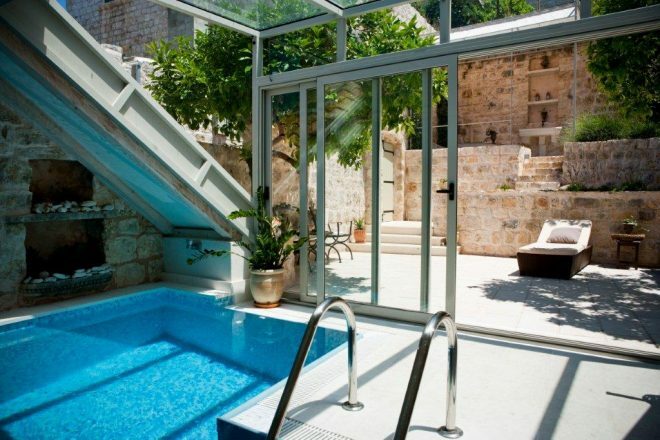 Once enjoying your Hvar villa holiday, we will be sure to recommend more. Pakleni Islands – a series of twenty-one islands, islets and rocks that hold secret coves and secluded beaches where you can enjoy the Mediterranean sunshine. Jerolim Island is one of a few of the Pakleni Islands which is a naturist beach, where you’ll be able to swim naked. Palmizana is the most popular of these islands as it is home to sandy beaches and a great tourist destination. 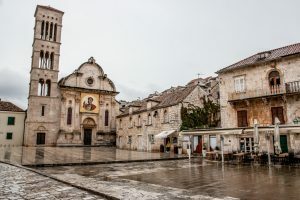 Hvar Cathedral – The St. Stephen cathedral is located in Hvar square, a great hub of tourism and entertainment, and is located on the main square. Inside the cathedral, you will find renaissance paints, a marble altar, gothic wooden choir stall and the cathedral museum where you can find more about the 15 centuries worth of history within the walls. Hvar Theatre – One of the oldest theatres, built in 1612, on the first floor of the Arsenal which you can still see today. Formerly one of the most important buildings of naval architecture in the Mediterranean, and now serves as a place of cultural events and exhibitions usually related to the sea. Fortress Fortica – This was built in the 16th century on a hill overlooking the old town that offers a magnificent view of the city of Hvar and the surrounding nearby islands. Stari Grad Museum – Stari Grad was home to the oldest settlement on the island and a rich, cultured history. Within the museum, you can see The Ancient Shipwreck Collection, which are artefacts from a 4th century Roman Galley. It is also home to a wide collection of ancient marine artefacts, alongside many other artefacts that tell of the cities colourful history. Stari Grad Plain – This is definitely one of the most extraordinary landscapes in Croatia. It was first colonised by Greeks from Paros in 4th century BC and has been maintained from then until now. Vrboska Church-Fortress – St Peter’s church was built in the 14th century before becoming fortified against the Turks in 1575. When you climb to the roof of St. Mary you will see a wonderful view of the town and bay. Humac – This “stone” settlement is a unique place on the island of Hvar and was originally a shepherd’s house. Throughout the centuries the inhabitants have made wine, raised cattle and grown lavender.